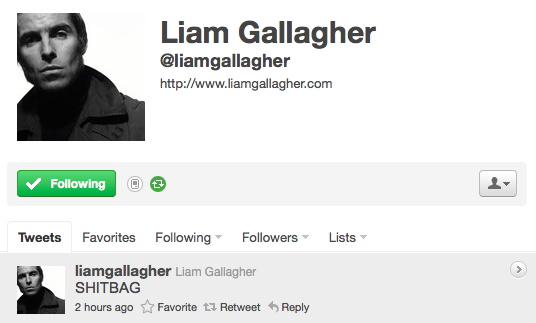 July 7, 2011 – Liam Gallagher used his Twitter account (@liamgallagher) to tweet “SHITBAG” moments after his brother Noel Galagher had a press conference to announce the release dates for his solo albums. The release date for Noel Gallagher’s first solo album “High Flying Birds” is October 17, 2011. Can’t wait to hear Liam’s “High Flying Birds” album review.